Can Roads be Made Safer with the Power of Fun? We’ve all heard that positive reinforcement works better than negative. But how can that principle be applied to safe driving? What if instead of just penalizing speeding drivers, people would be rewarded for obeying speed limits? In Stockholm, Sweden, a speed camera lottery does just that. Funded by Volkswagen, the idea was born of a competition encouraging people to think of creative ways to slow speeders down. The speed camera captures images of each passing car. Anyone driving at or under the speed limit is automatically entered into a raffle to win money. Anyone the camera catches speeding is fined- and that money goes straight into the coffers of the raffle jackpot. Think free parking in Monopoly- for grownups- with real consequences. Banking on the fun theory- that people can change for the better using the power of fun, the speed camera lottery had noteworthy results. Average speeds were reduced from 35km/hr to 25km/hr, a 22% reduction. People want to do better. No one wants to cause a crash. But getting them to acknowledge that speeding is dangerous and can have deadly consequences isn’t always easy. People think they’re immune to the dangers of speeding, that the rules of the road don’t apply to them, and that they aren’t really putting anyone at risk when they speed. There are many ways to change this- educational campaigns, traffic calming devices, speed display signs, speed cameras, and police enforcement. Enter something new to the lineup- positive reinforcement. At Traffic Logix, we’ve applied this theory to our variable message signs as well. 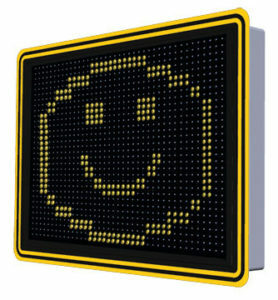 Programmable to display the message of your choice following any selected behavior, you can set your sign to respond with positive messages to drivers who obey speed limits. Instead of just flashing Slow Down at speeders, your sign can flash Good Job, Nice Driving, or any message you choose. With options for customized graphics, you can even display a smiling face or thumbs up sign. Everyone likes that pat on the back, the acknowledgement that they’re doing well, the reward for a job well done. What if that positive feedback could make our roads safer too? Can You Create More Complete Streets Without Structural Changes?